The Wilmington Art Association (WAA) was organized in 1971. Its early monthly meetings were held at Wilmington's New Hanover County Museum. This group was the second organization to use the name "Wilmington Art Association." The first was formed in 1953 and eventually became absorbed in the membership of St. John's Museum of Art -- which is now the Cameron Art Museum. A new Wilmington Art Association -- with 30 members -- arranged its first "Annual Labor Day Arts and Crafts Show" in 1971 at Greenfield Park and organized the "First Annual Christmas Show and Sale" at the Community Art Center located at 120 South Second Street. In 1972, the Arts Council of the Lower Cape Fear held its first "Arts Ball" at the Wilmington Hilton, in downtown Wilmington... and the Wilmington Art Association had an exhibit of paintings. The organization received its charter from the State of North Carolina in 1974 and is certified by the U.S. Internal Revenue Service as a non-profit organization. 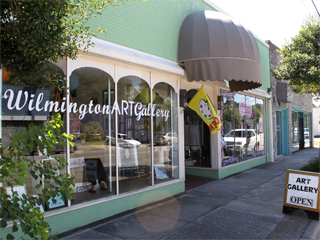 The first Wilmington Art Association gallery opened in the Spring of 1999 at Chandler's Wharf on Water Street in downtown Wilmington. In November 2006, the Gallery was relocated to 616-B Castle Street (shown to the right) -- where it operated through April 2011. Efforts are currently underway to locate an alternate gallery site. The Wilmington Art Association currently has more than 200 members... and encourages both artists and art lovers to join. Monthly meetings are held at the New Hanover County Arboretum, 6206 Oleander Drive, Wilmington NC unless otherwise stated. Meetings include a social beginning at 6:00 pm followed by the business meeting at 6:30 pm and educational program. For 2017, the meetings are the fourth Wednesday in the months of January, February, March, and May. From September through November the meetings are the second Thursday of the month. There are no meetings in April, July and August; June is the annual picnic; and December is a holiday dinner. Programs are posted on the Events Page. The general public is invited to attend all general meetings. Click for a complete list of dates and programs for the WAA General Meetings.